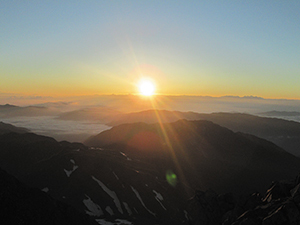 Hakusan National Park is stretching approximately 40 km north-south and 30 km east-west comprising the three peaks of Mt. Hakusan--the highest, Gozengamine (2,702 m above sea level), Onanjmine (2,684 m above sea level), and Kengamine (2,677 m above sea level)--and surrounding mountains. At the foot of the mountains at altitudes of 1,600 m or less are expansive natural forests comprising mainly Japanese beech, while in alpine and subalpine belts some 250 species of alpine plants can be seen, including Geranium yesoemse var. 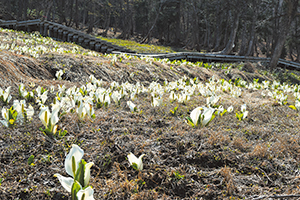 nipponicum and chocolate lily , and the primeval natural environment is being preserved. Moreover, the park is a habitat for the Asian black bear, Japanese serow, golden eagle, and other large wild animals and birds, and as a national park with one of the highest levels of naturalness in Japan, the park has been designated as a Biosphere Reserve in accordance with the UNESCO Man and the Biosphere Programme (MAB). In winter, Mt. Hakusan is covered in deep snow brought by seasonal northeast winds. In mountain areas at altitudes of 500 m or higher, it is estimated that approx. 600 million tons of snow accumulate. This snow is a major element in the formation of Mt. Hakusan's natural environment, bringing rich blessings to the foot of the mountains and nurturing a distinctive Snow Country landscape and culture. 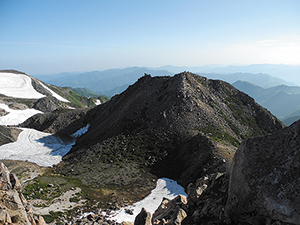 Centered around the main peak, Gozengamine, the summit area of Mt. Hakusan also comprises Onanji Peak and Kengamine peaks; together with the crater lakes of the Shin-Hakusan volcano scattered nearby--including Midori-ga-ike, Konya-ga-ike, and Senja- ga-ike Ponds--and plains formed by lava and pyroclastic materials-- including the Murodou Plateau, Midagahara, and Minamiryuugabanba-- these present a stunning volcanic landscape. The mountain mostly comprises sedimentary rocks of the Tedori Group; geological strata dating from ancient times, such as Nohi Rhyolite; and lava rock. These are covered by volcanic ejecta, and all together they form the Hakusan volcano. From the foot of the mountain up to an altitude of approx. 1,600 m, Mt. Hakusan is covered in extensive Japanese beech forest. Along Bessan-Ichinosedo, Hirasedo, Chugudo, and other trails, primeval forest containing huge Japanese beech trees can be seen. The subalpine forests at altitudes of between 1,600 m and 2,400 mainly comprise. Erman's birch and Abies mariesii, while Siberian dwarf pine grows in the alpine forests at altitudes of 2,400 m and higher. Found around the Mt. Hakusan area, the Tedori sedimentary rock group includes ancient geological strata accumulated between the late Jurassic period (170 million years ago) and the early Cretacerous period (110 million years ago). Numerous fossils have been discovered within these strata, including fossils of not only dinosaurs but also mammals, fish, and plants. The area is especially important from an academic perspective as one of the few locations in Japan for recovering dinosaur fossils. Due to differences in altitude, topography, time when the snow melts, etc., a diverse range of environments have been created on Mt. 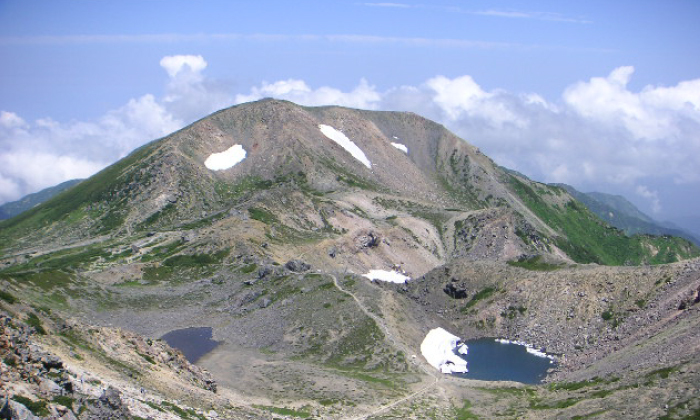 Hakusan, and alpine plants appropriate for these environments can be found growing in each. During the mountain summer season of July-August, the flowers all bloom at once, creating spectacular fields of flowers. Also, amongst the alpine plants growing on Mt. Hakusan are numerous species that have been named (generally in Japanese) after Mt. 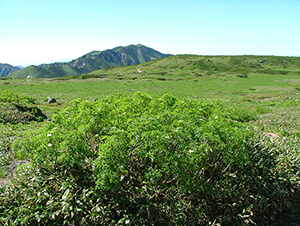 Hakusan or its main peak, Gozengamine, such as Primla cuneifolia Ledeb. var. hakusanensis (Hakusankozakura), Geranium yesoemse var. nipponicum (Hakusanfuro), and Cornus canadense (Gozen-tachibana). Mt. 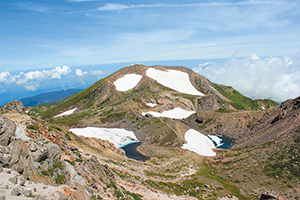 Hakusan is the westernmost mountain in Japan with an authentic alpine belt, and as such is the westernmost distribution limit for over 100 species of alpine flora, such as Siberian dwarf pine, Abies mariesii, chocolate lily , and Aleutian mountain heath. In addition, Mt. 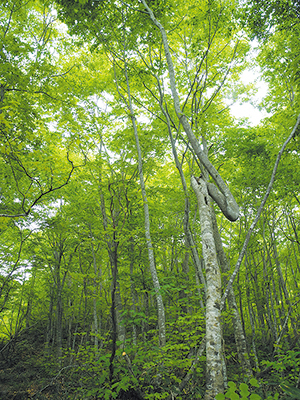 Hakusan has extensive broad leafed forests comprising mainly Japanese beech but also including Quercus crispula, Aesculus turbinata, and other Aceraceae species. These forests are home to large mammal species such as the Asian black bear , Japanese serow , and Japanese monkey as well as rare large raptors such as the golden eagle, mountain hawk-eagle in high densities, even from a nationwide perspective. The alpine accentor, which is a representative alpine bird species, lives in and around rocky areas near the mountain summit, where it is possible to hear the bird's beautiful song. Also, with regard to alpine mammal species, Japanese stoat can be found throughout the Japanese beech forests, mainly in the alpine belt. In addition to the Alpine Accentor and Japanese stoat , the Azumi shrew is another alpine animal for which Mt. Hakusan is the westernmost distribution limit. Due to its image of being covered in pure white snow, Mt. Hakusan has been referred to as a standout whitish mountain in Koshi (Pref. Fukui in old term) since ancient times. It is known as a sacred mountain opened up in 717 by Taicho Daishi, an Echizen priest, as well as one of Japan's three most famous mountains alongside Mt. Fuji and Mt. Tateyama. Because Mt. Hakusan is an independent peak with no high mountains around it, it is possible to gaze up at the mountain from the Hokuriku, Tokai, and Kinki districts, and so it has been known to people living in the capital since ancient times. Covered in snow during wintertime, Mt. Hakusan also acts as a landmark when seen from the ocean, and it has been worshipped as a sacred mountain since ancient times. 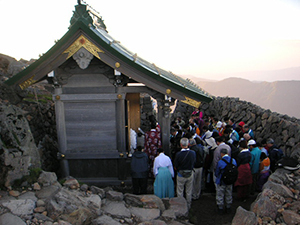 Located at the summit of Gozengamine is the Okunomiya (mountain shrine) of the Shirayamahime-jinjya Shrine, which is venerated as the head shrine of more than 3,000 Hakusan Shrines nationwide. Because the summit of Mt. 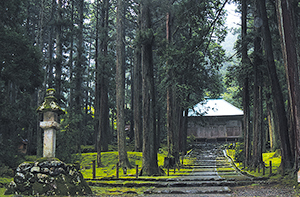 Hakusan was regarded as the ultimate destination for Zenjo (spiritual training at a sacred mountain), ascetic monks began climbing the mountain, and bit-by-bit roads were made. These trails were called Zenjodo, and the roads from Echizen, Kaga, and Mino were called the Echizen-Zenjodo, Kaga-Zenjodo, and Mino-Zenjodo, respectively. In 832, three stations--Echizen-banba, Kaga-banba, and Mino-banba--are said to have been established as bases for Zenjodo roads, and these flourished as bases for Mt. Hakusan worship. The relics of buildings such ad training halls and lodgings can still be seen today in these locations. At the center of Kaga-banba was the Hakusan Hongu/Shirayamahime-jinjya Shrine in Tsurugi, Hakusan City, in Ishikawa Prefecture. As the first shrine of Kaga (Pref. ishikawa in old term), rituals for domain lords were regularly performed here from the Heian Period through the feudal period. 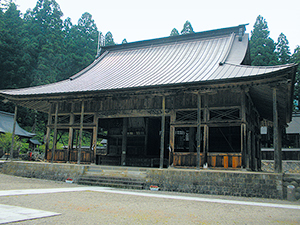 At the center of Mino-banba was the Nagataki Hakusan-jinjya Shrine/Choryuji Temple in Shirotori, Gujo City, in Gifu Prefecture. In the past, this station was highly prosperous. 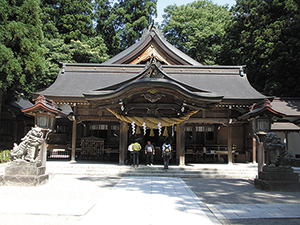 At the center of Echizen-banba was the Heisenji Temple in Katsuyama City, Fukui Prefecture. At its most prosperous, the shrine owned land to the value 90,000 koku (the ancient economic unit) of rice and boasted 48 sub-shrines, 36 chambers and 6000 viharas, forming a huge religious city.